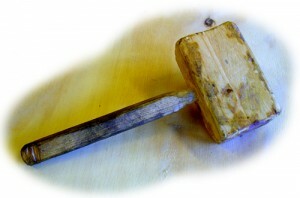 The wooden hammer. It took five minutes to make and it has given hours of joy. Very good to have when tapping joints into place, or anything else that is afraid of being dented (eg. your fingers). The chisel also prefers a wooden hammer to an iron one. This tool has been a delicate friend to the shipbuilders around the world for thousands of years and probably continues to be so for at least some time to come. A good investment of scrap wood.